It's the camels that clinch it. We are driving out of the desert after a couple of nights spent Lawrence of Arabia-style in the sand dunes when our driver spots a group of them loitering around a makeshift corral. I'm not enthusiastic to be honest, previous camels in my experience being of the mangy, flea-bitten, ill-tempered, phlegmy, biting variety, all hump and halitosis. These, though, are straight out of camel central casting, the Hugh Jackmans of the dromedary world. There are two free-range specimens hanging around a fenced-in area containing a couple of females and their sickeningly cute offspring. The first two adults wander over, allow themselves to be petted and essentially put on a show that would give Greatest Showman Hugh a run for his money. And that's when it hits me; Oman is what the Middle East would look like as reimagined by Disney. These even-toed ungulates (thank you Dr Google) would walk into a job at "Arabia World". This is the place for people who think the prospect of a holiday in the Middle East is about as attractive as a night watching Peter Dutton do stand-up at The Comedy Store. In a region beset by more than its fair share of problems Oman is clean, safe, friendly and beset only by the issue of how that sand gets into every conceivable crevice of both you and your luggage. Tucked away on the Arabian Peninsula with the Gulf of Oman on one side and the Arabian Sea on the other, the Sultanate of Oman shares land borders with Yemen, United Arab Emirates and Saudi Arabia, and marine borders with Iran and Pakistan. And it's on good terms with all of them, making it the perfect place to dip a toe into the region. The Middle East on training wheels, if you will. Since its emergence from, effectively, the Middle Ages in 1970 when Sultan Qaboos bin Said al Said deposed his father, Oman has transformed into an Islamic society that prides itself on being able to reconcile its traditional life and values with the needs and wants of a modern 21st century nation. Here, you won't find the skyscrapers of Abu Dhabi or Dubai thanks to an edict by the sheikh that all new buildings must conform to Arabic architectural styles and height restrictions to eight floors. In 2016, Lonely Planet declared Oman to be on the way to becoming a top-tier destination. Three years later that's still true. Even with all the government money being invested in tourism infrastructure it's still a little-visited country with what the bean-counters call "long-term growth potential". Check-in person: "Where are you off to today, sir?" Check-in person: "Oh, we don't send many people there." Me: "Why, is it rubbish?" Check-in person [laughing]: "Oh no, it's supposed to be very nice." And it is. This is evident from the moment you step off your Oman Air flight into Muscat's $US1.8 billion international airport. Only opened in March last year the new airport is an impressive state-of-the-art building that has been 10 years in the planning amid hopes of increasing tourism numbers. 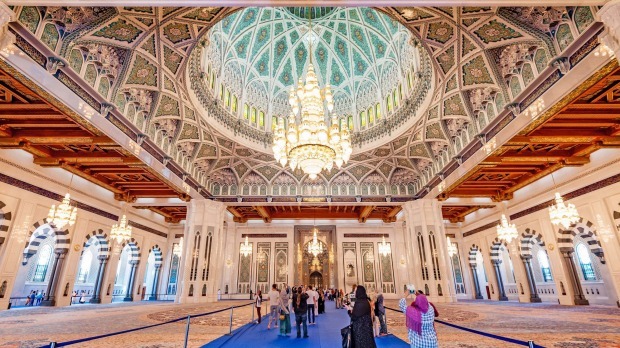 Brand spanking new airport aside, Oman is a low-key destination in comparison to its near neighbours with their towering buildings and insane hotels on reclaimed land – and that's a large part of its charm. It's a mostly English-speaking country with a very low crime rate, no religious strife, amazingly hospitable people, a colourful culture and traditions, beautiful coastlines, vast areas of spectacular natural beauty, and very nice hats. It's also shot through with ancient forts, desert oases and a modern road network that makes getting from place to place a cinch. We start our seven-day Taste of Oman tour in Muscat, the capital, before heading off in air-conditioned minibuses to explore the northern interior. It's a journey that takes us through vertiginous mountain ranges, across the wave-like dunes of the Wahabi Sands desert and into water-filled oases. On the way we visit a small fish market, a bustling early morning animal auction, vibrant souks and get a taste of the extraordinary Omani hospitality by breaking bread with a Bedouin family and visiting a friend of our guide, Said al Salti, for a fun lunch of fruit, bread, tahini, dates and Omani coffee so strong it'll alter your genetic code. And we pause for forts, too. Pretty much every Omani city and town has a castle, fort or tower, built mostly during the 17th and 18th centuries. Today, there are about 500 of them scattered throughout the country. Some are merely crinkled excrescences on a hilltop but the larger ones have been renovated and offer a mesmerising insight into the ingenuity that went in to building them, from the secret underground passages to the deep wells, the intriguingly stained date stores and the somewhat creepy killing holes above the front doors (through which boiling date oil was drizzled onto any hapless invaders). One such is Nakhal Fort, an easy 120-kilometre drive west of Muscat. This beautifully restored fort was originally built around and on top of a bulbous outcrop of rock and is today surrounded by plains filled with palm tree orchards. To stand on its upper levels, ramparts dotted with old iron cannons pointing out at non-existent foes and with the Jebel Nakhal mountains as a magnificently jagged backdrop, is to travel in time. This is especially true when Said, our guide, steps out of a sandstone doorway dressed in his traditional pale blue dishdasha and kumma hat. If it wasn't for the mobile phone he could have stepped straight out of the 17th century. Close by is the shaded oasis of Ain A'Thawwarah, where a warm spring wells up out of the earth and where a few of us sit with our feet in the nearby river and let the fish nibble our feet. 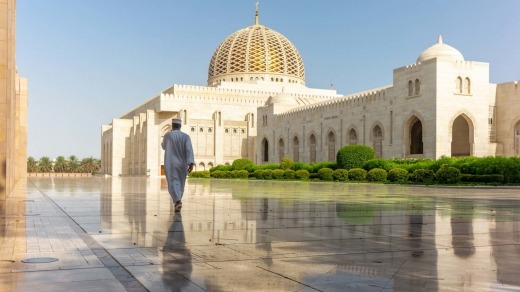 Of course, no visit to an Arabic country would be complete without a visit to a mosque – and Oman has 5000 of them, the largest being the Sultan Qaboos Grand Mosque in Muscat, which opened in 2001 and attracts 20,000 people for Friday night prayers. Foreigners are not allowed in on Friday nights, understandably, but a midweek, daytime visit turns out to be a highlight. It might be still relatively new but the grand mosque is delightful even to the eyes of this infidel, who used up many millions of pixels taking photographs of the 50-metre high main dome, the gigantic chandelier, the single-piece carpet (the second largest in the world), the marble pillars and pretty much every other centimetre of the place. For all its natural beauty and wonderful tradition, though, Oman's greatest asset is its people. The Arabic word, habibi, can be translated as "my friend" or "my brother". Remember it if you go – you'll need it. Keith Austin travelled as a guest of Peregrine Adventures.